Kia announced a new electric car, the 2015 Soul EV. The vehicle has a 109 bhp engine and a 27 kWh L-ion battery that gives it a range of 93 miles. This environmental friendly car uses 23 kg of plant-based interior plastics (made from cellulose and sugar cane base). 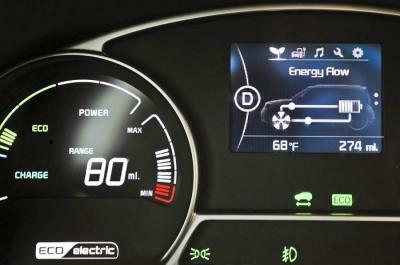 In the instrument cluster, the Soul EV uses a 3.5" OLED display. It provides information on the energy flow, charging time, ECO driving level and energy economy. It also provides a three-stage alert for the Soul EV’s State of Charge (SOC) - so you can quickly determine when it's time for charging. Kia did not disclose the display maker, but I believe this PMOLED panel was produced by Futaba, and it sports a 228x168 resolution. It is great to see new automobiles with OLED displays. The automotive market may become a good driver for OLED growth - for both OLED displays and lighting. LG Display recently announced that it signed OLED display supply contracts with several car makers in Germany (including Daimler-Benz) - and it is believed that these are plastic-based flexible OLEDs. OLED lighting is also set to enter the automotive market soon. According to several companies, such as Philips, BMW, LG Chem and OSRAM, it is expected that the first car with OLED lighting will hit the road in 2016 or 2017.